Creating resources for safe and compliant Dangerous Goods transport isn’t generally considered a creative business. Unlike practitioners of film, music, television and literature, we don’t dream about winning awards. And yet, we have. Last week, at Industrial Pack 2019, our Obexion lithium battery packaging won the Industrial Packaging Award for Excellence in Transit Packaging. There was no glittery award ceremony, no red carpet and no paparazzi. We didn’t get to give an acceptance speech. But if we had, here’s how it may have sounded. Wow! Wow! Thank you so much! It’s an incredible honor to be recognized. When we set out to create a better package for shipping lithium batteries and battery-powered devices, we had no idea how big a story it was going to be. We just wanted to help. Remember, just a few years ago, most lithium battery shipments required no special handling at all. But the hazard of thermal runaway causing a fire in a plane’s cargo hold or the back of a delivery van was very real, and our regulatory bodies began to enact rules to mitigate the risk. These regulations were necessary. But they made life a lot more challenging for thousands of shippers. By April, 2016, you could no longer transport standalone lithium batteries as cargo on passenger aircraft without special exemptions. People freaked out. And we knew we had to do something. What if we designed a new kind of fiberboard box …? To ship batteries and devices safely and compliantly some companies were resorting to heavy wooden crates, metal or plastic boxes. There were fiberboard solutions, but they required heavy liners, pellets or gel packs, and they were super-complicated to assemble. We said, what if we designed a fiberboard box with mitigation technology baked right into the material? What if we could make a simple solution for all sorts of lithium battery shipping situations—from individual customer returns to everyday recycling to massive recalls? What if this box required no gel packs, heavy liners, pellets or fillers, and it arrived pre-assembled with easy-to-understand directions? It would save shippers time and headaches, and the lighter-weight packages would save them shipping fees, too. What if we could shoot a video where we trigger thermal runaway in one battery in this box—containing twenty 24-wH lithium batteries at 100% state-of-charge—and not only wouldn’t the 1200° fire escape the box, but the other 19 batteries would only suffer minor damage? And what if we gave it a weird Latin-derived name? Well, that’s how Obexion came to be. And while we’re thrilled to win this award, we’re even happier that manufacturers, shippers and third-party logistics providers have simplified their jobs and protected millions of shipments with Obexion packaging. So many people and organizations to thank! Thank you to the team at PA2. Obexion wouldn’t exist without you. Thank you to the folks at IATA for the literally thousands of hours that go into enacting the regulations governing lithium battery transport by air. You truly make our skies safer. Thank you to the U.S. Department of Transportation for issuing Special Permit 20432, allowing shippers to transport damaged, defective or recalled (DDR) devices by ground as excepted shipments with Obexion Max. 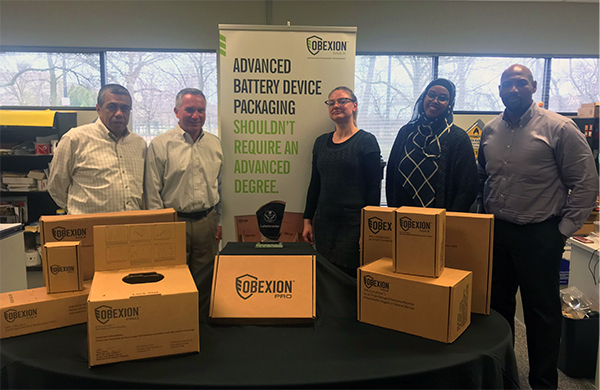 Fully regulated shipments require special training, but employees can package DDR devices in Obexion Max with no training at all. So can consumers returning the devices. Thank you to the panelists on “Lithium Battery Day” at the Dangerous Goods Symposium who remind us every year how important—and challenging—it is to ship batteries and battery-powered devices compliantly. Finally, thank you to all the shippers who have made Obexion boxes a key part of their operations. 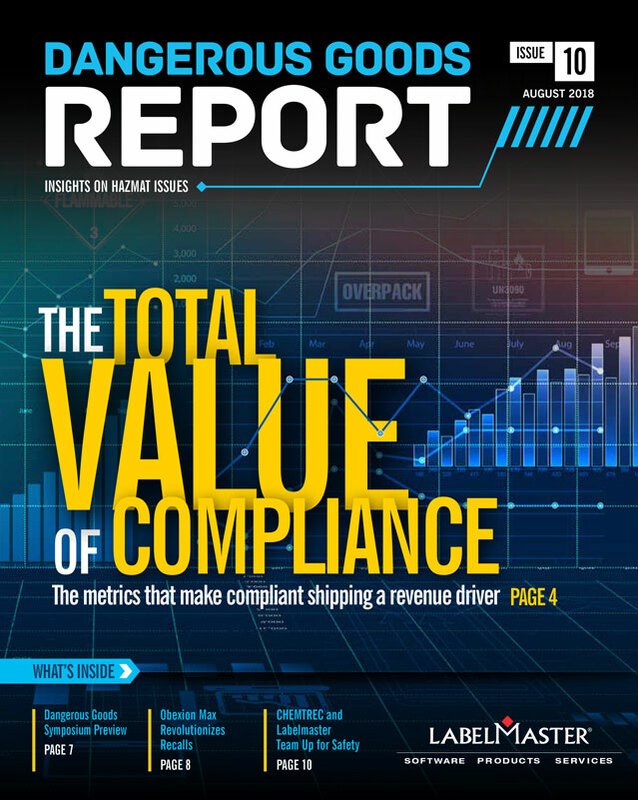 You get the value of compliance and you make safety your top priority. You’ve made Obexion your top choice, and this award belongs to you, too! Shop the complete line of award-winning Obexion lithium battery packaging. And keep tuning in for more news about Obexion!